Why Is Play Bow Inviting? I’m currently writing a book on body language so that my model can be applied to the things we see dogs do everyday. In the meantime, and in sort of a crowd-sourcing way to flesh out my argument, I would like to pose the following question to a science-based trainer or a behaviorist. After a dog performs a play bow, play often results and so this seemingly justifies the interpretation of the above position as an invitation to play. On Patricia McConnell’s website is a comprehensive post on the latest thinking on the play bow. But an obvious question is never asked in these treatments: Why does this particular configuration of the body constitute an invitation to play? What specifically is being conveyed by a hind end held high and a front end being lowered, and with a dog curiously perched on spring loaded forelegs, that indicates as a “meta-signal” that said play-bowing dog intends to play? In other words, what specific information is the the object of a play-bow pulling from this signal so that he can be assured the sender is intending playful consequences? Meanwhile Coppinger in “How Dogs Work” shows a sheep-killing dog play bowing before a sheep that for some reason won’t run. Bekoff in excoriating fashion has dismissed Coppinger’s argument in the overall, but has conspicuously failed to address this point. His failure to account for this behavior is all the more curious because mainstream behaviorism has not arrived at a consensus for why there is play in the first place. One would think that in the absence of such a model the intellectually curious would be open to all kinds of possible interpretations. Bekoff may want to dismiss this as an isolated anecdote, but I’m sure there are countless examples of this among the dog owning community and after a few million anecdotes it becomes data. It’s been my experience that if we pay the most attention to the seeming incongruities rather than dismissing them, we are best able to construct a model. Meanwhile my argument is that the play-bow is not an intentional invitation to join in play and in my model the play-bowing dog about to pounce in play on a playmate, is not inconsistent with a play-bowing dog about to prey pounce on a prey-mate. I would welcome a science based trainer or behaviorist to demonstrate what specifics of a body performing a play-bow represents a conscious intentional signal to join in a round of play so that it is received in the mind of another as a metal-signal for just that. To date I have failed to find an explanation other than the dog looks playful and play often results. But why does the dog look playful, what is it about that posture and demeanor that makes an observer “feel” something? The best argument I can think of is the Principle of Antithesis by Darwin wherein those equal and opposite muscle patterns from one useful behavior, seem to be employed in other ways and are available simply because they are not in service to the useful behavior. But this doesn’t really address why the play bow looks playful, just that it’s the opposite of being aggressive. So if someone is not being aggressive toward me I should want to play with them? And this also presumes that the play bow is of no service in and of itself, and it also doesn’t explain why a sheep killing dog would play bow before a sheep that won’t run, perhaps it has a service in ways that have not yet been envisioned by the mainstream consensus that strives to read cognition and intention into these signals? This is the problem with the materialist, reductionist approach, if it isn’t random and natural selection, then it must be Intelligent Design, if the play bow isn’t instinct, then it must be thinking. But these aren’t the only options, we are being presented with a false dichotomy. There is a flow option and this is the underpinning of modern Thermodynamics. If you read “Design In Nature” you will find that Bejan is definitely not promulgating I.D.. He happens to be one of the top cited scientists in the world, a pretty good barometer of credibility, and he’s not adapting to modern understandings, he’s creating them. And “Arrival” is written by a front line mainstream biologist who sees his book as additional to the phenomenon of natural selection, foundational but not overturning it. (I think he’s wrong, I think he has overturned it.) Or see “Origins of Order”, or Jeremy England about how DNA and self replicating molecules are viable not because they are good at replicating, they are good at replicating because they are the most effective way of transferring heat. It’s not about gene transfer, it’s about heat transfer. I personally may be taking their ideas farther than these various authors, but I do so not by leveraging their work, but through a logical argument derived from the behavior of dogs studied as a function of flow and in reinforcement to what I’ve already discovered through an immediate-moment method of analysis. I’m not concerned with the WHO created or the WHY of life questions. But the HOW life works question. Someone can study electricity and arrive at some sophisticated understandings and have not a clue as to the ultimate source of electricity. They don’t begin with WHY there is electricity. This again speaks to the problem of reductionist materialism of modern behaviorism, it can’t disentangle its line of inquiry from the WHO-WHY and HOW questions Thus the HOW gets invested with all manner of hidden assumptions inherent in the WHO-WHY (if not God then randomness) starting off point. But why start there, why not just consider the behavior of animals in real time and rigorously resist the projections of human psychology onto their behavior? Furthermore, if inanimate systems that are only subscribing to energetic principles are manifesting the exact same hierarchal structures as do social beings, then it is parsimonious to seriously ask and explore whether animate systems likewise subscribe to energetic principles. Rock on d00d. Keep on applying such deep thought to dog training! Dan, I think you could benefit from getting your hands on a copy of Adrian Brian’s book “Design in Nature” or “the Physica of Life”. If you think anyone here is saying anything related to the fallacies of intelligent design you’re engaging this conversation with a handicap. This is cutting edge physics and flow system principles, along with some heavy sprinkling of the simple rules of complexity science. I don’t claim to be an expert myself in any of this but once you understand what Kevin, and Adrian Bejan, and Coppinger, and other complexity/systems researchers are saying it’s thrilling stuff. Thanks, Willem. Will try to look into it in the future. Yes, this is fundamental to critical thinking and actual science (as opposed to pop hypothesis). There are seekers and then there are those who want to be right no-matter-what. b…, if that snipe was directed at me, you are deeply wrong in your interpretation of my mindset. I would also add that restricting the ability to ponder and hypothesize about topics such as these to only academia residing in the walled garden of the appropriate specialty background is pretty myopic. I should like to venture an interpretation of what the play bow really is. This is not not deep thinking or deep intelligence, but comes just from observation of the few dogs (family pets) I’ve owned in my lifetime. I believe that the play bow is simply a stretch. I’m sure we’ve all seen dogs stretch when they wake from sleep, and the play bow configuration is almost always part of that stretch routine. Perhaps the isolated play bow is the dog’s way of limbering up just before springing into action, whether to play fetch or tug of war or to attack and eat a sheep. I’m sure we’ve all seen our top athletes on TV (e.g., in games or in the Olympics) doing stretching exercises just before going out and giving their all in exertion and tension release/relief. What do y’all think. I’d welcome any and all input. 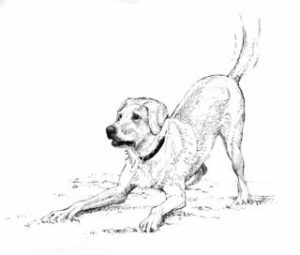 P.S., Addendum: Besides being a stretch, the play bow may also be one of the dog’s “ready” stances in anticipation of springing into action (cf. Kevin’s “spring loaded forelegs” comment from above), similar to Olympic athletes’ “ready” stances at the start of track races, or a football lineman’s three point “down-set” stance at the start of a play. If/when no subsequent action occurs, then the play bow stance just looks like an “invitation” pose. It’s thus an early part of an uncompleted cycle preparing to release an inner tension: being “ready” to play or … eat a sheep. ‘Like Shannon, I am also just an interested layman, but her post and the bit about the sheep-killing dog started a train of thought that made me wonder whether the play-bow is simply an imitation of an “I’m about to pounce on you” body position, and the fact that only a play fight (or by extension, other types of play) is intended is conveyed by other cues common to play-fight behavior, like tail-wagging and lack of snarling and growling. However, I was shot down by Kevin and others due to my thinking not having enough to do with thermodynamics theory, to be by definition wrong because I used “complete human sentences” to posit an explanation, because “Darwin is wrong that things vary at random”, and to just be a wrong-from-the-get-go “materialist, reductionist approach”, so don’t expect much support for your thoughts. Personally, I believe science dictates that we allow for a multiplicity of theories until there’s enough evidence to hone in on just one, rather than rejecting whole schools of thought because they don’t fit into one’s preferred paradigm. Tony I think the stretch is quite a valid and astute observation, what you’re alluding to therefore is the locomotive rhythm indirectly because of course stretching would be on the continuum of the mechanics of movement. My argument is to keep on going and hone in on the source, the mechanics of movement. So a stretch is relaxing because it’s the opposite of tensing the muscles, the tensing of muscles being the necessary mechanics for propelling the dog forward. The problem with the stretch formulation is that it doesn’t directly address why that would prove inviting to another dog. (Dan is putting forward some ideas) In other words, so what if the dog looks relaxed, that’s just as much an invitation to attack it according to standard evolutionary theory. Why would that induce a playful mood in certain observers so that they find themselves wanting to reciprocate. My theory is that resistance to movement is how the process of objectification works mentally and so various body poses incite various emotional responses since emotion is about the mechanics of motion. If the individual can work in sync with another, then they gain the benefit of free energy, energy they can’t realize through singular action. Since the locomotive rhythm is a wave form, then getting into sync would constitute generating a physical action that is wave like and can match up with the wave form of the other being. This formulation doesn’t require putting a vast human like psychology into the minds of the interactants, which should give one pause since the emotional systems evolves many millions of years before the higher cognitive functions. So I trust you can see why I resist those psychological treatments as I find them wholly unsatisfying. Dan I greatly appreciate your contribution and want to state it explicitly because of course this is combat on the theoretical level so can sound rather terse. But I would like to point out that NDT is the outlier of the preferred paradigms. There is no other place where thermodynamics is applied to behavior and the way the animal mind works. Also, my model is the only one that is wholly predicated on the ultimate essence of Darwinian logic, i.e. that the advanced evolved from the simple. But this thinking eventually led me to discover that things, such as social traits and prey making strategies, do not vary at random. There is a universal code to which all organisms subscribe so that it is more logical to understand that nature evolves as a whole rather than as a system of disconnected parts in competition with each other. Then finally Constructal law came along showing the universal thermodynamics of physical movement as the basis of evolution and that nature evolves as a whole. So science is trending in NDT direction, most notably Adrian Bejan and Constructal law as I mentioned above. However there are many new disciplines pointing out that Darwin’s natural selection between randomly variable traits is not enough to account for the evolution of species. (See “Arrival of the Fittest” Kaufman’s “Origins of Order” and many more) Furthermore the science of collective behavior is now saying that complex systems are self-organizing, something I realized of canine sociability in the early eighties. I got there because I didn’t substitute human psychology for complex behavior if I could find a simpler explanation in accord with Darwinian logic that the complex evolved from the simple. Unbeknownst to me I was developing a thermodynamics of emotion and this proves to be the basis of self-organizing complex behavior in dogs and wolves. Okay so if we look at the examples of when dogs play bow, it’s when they are dealing with objects-of-resistance. So if a dog has intense prey drive to a squirrel in the woods, we will never see a play bow in that situation since stimuli means go on sight, prey, but to a belligerent or recalcitrant moose quite possibly we would because resistance can trigger more complex manifestations of the prey-making module, i.e. sexuality and personality, i.e. sociability. At the same time, if someone had a pet squirrel and raised a pup in that context, the dog would readily play bow to the squirrel if the squirrel for some reason refused to move. The reason would be resistance-to-movement, which then triggers these more complex adaptations such as sexuality, sociability and personality, and then again it can be shown that these are but subsets of an emotional wave mechanics. The wave mechanics is the stuff of being social, it’s the only logical way the mind can sync up with emotionally relevant stimuli. I also want to point out that it is intellectually honest to reject a whole school of thought that contradicts itself. If an apple falls up, we have to question the prevailing model for gravity. So on a quantum level Einstein threw out Newton’s mechanics as full explanation. But in Dogdom, everything dogs do contradicts all the overarching explanations, but all we get is more complex iterations of the same old same old, exhibit A, access to resources establishes a dominance hierarchy without there being a dominance or submissive impulse inborn in the individual. Huh? That’s a nonsensical formulation that now passes as high end scientific explanation. It is intellectual expediency rather than intellectual rigor. Thanks, Kevin — that makes me feel better. It does sound like I need to read “Arrival of the Fittest” at minimum. But who’s saying that dominance and submission impulses aren’t inborn? I think most zoologists consider that to be instinctual, not learned behavior. Don’t dogs exhibit the same submissive body language like the tail between the legs even if they haven’t ever met other dogs? Thank you both, Kevin and Dan, for your positive comments on my thoughts about the play bow. Kevin – I was indeed thinking about the stretch in terms of being a part of the entire continuum of the mechanics of movement, but I was so focused in my comments on the play bow itself that I didn’t follow the thought through. Thank you for directing my thinking to encompass the entire process of the mechanics of movement, as you clarified much in my initially somewhat hazy conception of the process. The clouds continue to dissipate. I don’t like to give homework so that book was a bit of a tough slog for me, there are some good popular articles summarizing the new thinking on evolution that are easy to digest. At any rate yes indeed these behaviors are inborn. My argument is that they have nothing to do with dominance and submission, those are thoughts that the human mind automatically and involuntarily project into the dog’s mind. What the dogs are actually doing are positioning their center-of-gravities so as to wave couple since moving as a wave is a dog’s perception of well-being. In other words an object materializes in a dog’s mind as an array of points, transposed from the dog’s body onto the object. If the dog can position his body relative to the object so that in tandem they compose a wave, then the dog feels as if he has reacquired a state of emotional equilibrium which the phenomenon of being stimulated dislodged him from. The dog has no idea what might be going on in the head of the other dog, although that might seem hard to imagine since the eyes of the other dog activate the subject dog’s awareness of his own p-cog, so it looks like a high cognitive interface, but the connection is happening an a basic primordial level of the mind, the sheer architecture of the makeup that is wholly dedicated to the mechanics of motion. The subject dog projects his feeling for his p-cog (e-cog) onto the form of the object dog and the rest of the points essential to movement follow from there. There is only one motive, to move. And these locomotive points integral in the structure of the anatomy are essential to the mechanics of movement. So called dominance is a dog occupying the peak phase of the wave form, submission is a dog occupying the trough phase of the wave form. One shoulder is in UP state, one shoulder is in DOWN state so that the combined forces of the dogs are now made neutral, i.e a return to equilibrium. If we were to argue which one is in control of which one, it would be easier to make the case that the DOWN state is more controlling since we see “submissive” dogs roll right into it in order to mitigate the pressure of the UP dogs. The DOWN dogs then quickly learn how to leverage their advantage and take complete control of the situation. They have no idea of being submissive, it’s simply inborn in every dog to find their place in a wave form by adopting one or the other states. Every dog prefers the UP state as otherwise entropy would take over, but DOWN is a complete release from shoulder tension and so it has its sensual advantages. This is why we see highly social self-confident dogs roll over in play with weaker dogs so that they can make a wave form. This is akin to a heavier kid sitting closer to the fulcrum of a seesaw so that he can achieve weightlessness across from a thinner kid. He self modifies to experience flow, he’s not submitting to the other child. The seesaw example as an energy flow system is further illustrative because it shows how each individual can flip from UP to DOWN, it’s not static. This is obvious to us because the time scale is so short, we therefore don’t see the same thing happening in the social dynamic of dogs since in many cases the time scale is so much longer. But it’s the same, one in fast motion, one in slow motion. Hmm. I can buy the wave function equilibrium thing for some of the behaviors, but I don’t really see what the tail between the legs or the ears back, for instance, have to do with the sheer mechanics of motion and wave-coupling with the “dominant” animal, especially if the other animal is a human rather than another dog, lacking a tail and movable ears. Or the licking behavior that dogs appear to do in some cases to show submission, or the partial urination some do when very fearful and ultra-submissive. I’m also very uncomfortable with the evidenceless assumption that “the dog has no idea what might be going on in the head of the other dog”. To go back to my example of animals like squirrels that steal each others’ cached food, why do they elaborately pretend to be caching food in order to fool any onlookers into trying to steal from an empty cache? There’s certainly nothing about the basic mechanics of motion to explain that — all that pretend burying would just be wasted energy, and the onlookers are generally not moving, and are not always even known by the squirrel to be there. Also difficult for me to imagine sham-burying of nonexistent nuts to be a behavior that just occurred as a random variation of behavior that would normally be ridiculously maladaptive and even “insane”, but stuck around because it paid off in the long run. And I realize corvids are smarter than dogs on most measures, but experiments have been conducted in which ravens caching food take measures to avoid giving away the location if they hear (but not see) another raven on the other side of a partition when a peephole is open between the two (and thus it *might* be possible for the other raven to see, even though it is not observed doing so), but not when the peephole is closed. Dogs reading humans’ facial expressions (which differ from the equivalent appearances in dogs) and acting accordingly, even in the absence of other cues related to motion or tone of voice also would seem to argue for some level of theory of mind. Many experiments regarding animals following other animals’ gaze direction and changing their behavior accordingly also seem to show a theory of mind. And dogs even handily beat chimpanzees in tests involving a human pointing to the location of hidden food. I’m very very wary of assumptions like “the dog has no idea what might be going on in the head of the other dog”. It reminds me of the old “official truth” (sadly still believed by many) that animals other than humans (or perhaps humans and other primates) are just machines, incapable of true feeling, in particular suffering. And experiments and observations in the wild have shown that a wide range of animals appear to have empathy and act to alleviate other animals’ suffering (including animals from very different species than their own). Is it really reasonable to posit that things like true emotions and theory of mind just suddenly popped into being with humans, or primates in general, or is it more likely that there is a spectrum of ability along those lines shared by a wide range of animals? Experiments have demonstrated that even fish likely have emotions, and no, that hook is not painless to the fish, nor is it just in a normal, neutral state of mind while suffocating to death after being caught. KB: The first experience of the fear of falling relative to other living beings is when the pup is knocked over and rolled around by its mother in the first days of life. Note that the pup is deaf and blind, has no idea what’s going on, and cannot urinate or defecate on its own. But then all is well once its mother nestles over it and it nurses. My theory is that these physical memories are being triggered when dealing with intense social resistance. Licking lips is memory of suckling, literally reliving memory of the taste of mother’s milk, urination is memory of being licked by mother so as to induce urination and bringing relief. So so-called submissive urination is finding relief from social tension, which then deflects attention of other dog onto its markings and then they are able to align and synchronize around this “object.” It has nothing to do with dominance or submission and everything to do with wave-coupling in order to wave make. KB: Bear in mind there is no direct evidence proving theory of mind and time-centric narratives going on in the heads of animals either. It is all a matter of interpretation of the evidence and therefore everyone, not just me, is making an assumption. For example, Darwin assumed animals vary, and that there is not enough food for all and therefore there is a competitive, winnowing process called evolution. He knew not of genes and he proves to be wrong about the competition between species based on Malthus’ proposition there was not enough food for all. He made assumptions and science advanced on the reasonableness of his assumptions with the theory requiring revisions as direct and solid evidence came in. My argument is does theory of mind capacity make sense. If this were true, then we could expect to see these highly intelligent problem solving animals start solving the problem of their Malthusian environmental limitations, as man did by radically changing his environment due to the capacity to compare one point of view, and one moment in time, to another. We could teach every ape in the jungle sign language to the point where they master the concepts behind the language, and yet in a million years I don’t think they’d evolve their way out of the jungle. The environment will have to change first, and then they’ll change. My argument is that they’ll change not according to their own genetic blueprint, but according to how nature as a whole needs them to change. Epigenetics suggests I’m right. Dan: “To go back to my example of animals like squirrels that steal each others’ cached food, why do they elaborately pretend to be caching food in order to fool any onlookers into trying to steal from an empty cache? There’s certainly nothing about the basic mechanics of motion to explain that — all that pretend burying would just be wasted energy, and the onlookers are generally not moving, and are not always even known by the squirrel to be there. KB: I believe an object comes to mind as a function of motion. Sensory data doesn’t compose an object according to its characteristics, but according to its resistance value relative to motion and in another way of saying this, in a theory of body, all things are connected. So anytime an animal deals with an object, it’s not an object per se in its mind, but an object-of-connection, infused with social value. This is a group mind perspective, it’s not possible for an animal to conceive of an object without his entire network of social affiliations becoming imbued within its form. And this is because an array of locomotive points, places on his body that are essential to locomotion, are projected onto the form of an object, and just as an animal relates to other living beings in terms of motion, so too does it relate to inanimate objects. And now Constructal law comes along and shows that systems of animate beings self-organizing according to the same laws by which systems of inanimate objects self-organize. It’s a flow hierarchy. So when we see hierarchy in dogs, it’s not a dominance hierarchy, it’s a hierarchy for sure, but a flow hierarchy. In my model, even the act of ingestion follows from the locomotive impulse. But at any rate, if one is arguing that squirrels are aware of the points of view of other, then they therefore are surely aware of the coming winter and this is why they cache food in the warm season. We should also expect to see the duller witted squirrels dying off because like humans, some lack the foresight to be aware of a new point of view. And if that were true, then an animal with T-o-M capacity would also be capable of taking stock of its life and rating it according to the value of the lives they see other squirrels living. If one accepts that one assumption of Theory of Mind, many absurd conclusions follow. Whereas in a theory of Body formulation, many reasonable conclusions follow and which far better suit the evidence. KB: The peephole is a negative (break in the continuum) i.e. an eye, that then becomes active when complete with the sound of a Raven beyond. Kevin: There is “emotional momentum” i.e. all the physical momenta in the system and which is attributed to the stimulus, even if it is of the subject’s making. So facial expressions convey 1) is emotional momentum being absorbed and 2) can emotional momentum be conducted. Thus every facial expression and physical deportment conveys emotional information that is universal to all emotional beings. It’s not a mental faculty of high reasoning, it’s a feeling. KB: If Theory of Mind were true, then chimps should handily beat dogs, that is a dead give away that shocks me that theorists don’t understand. The reason dogs are so sensitive to human gaze is that they can more readily map their body onto any and all classes of objects and thus feel where the emotional momentum in the system is being directed. KB: The irony is that the high cognitive school is actually saying that animals are machines. Because they are reductive, and are ending up with the nuts and bolts and all will end up prescribing drugs for remediation rather than understanding how emotion works as a group energy. My immediate-moment group mind theory is the only system that argues for emotion and feeling as universal to all sentience (thus nature evolves as a whole just like the internet evolves as a whole and in terms of conductivity not competition.) and can easily accommodate the phenomenon of empathy and suffering. I ask, what would be easier way for these social virtues to evolve and at the same time end up being present in the lowest creatures? Empathy as an extension of one’s mind invested in others, or empathy as an extension of one’s body invested in others? I feel the latter is the obvious answer.